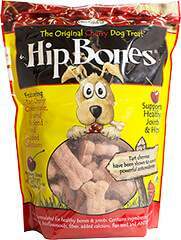 Hip Bones® are not only a tasty treat for your dog, they are full of carefully selected ingredients supporting strong bones and healthy joints. Our dogs love'em! Featuring tart cherry concentrate, ground flax seed and added calcium to support healthy joints and hips.